Lost Viking is way too hard. It's a "puzzle" rpg where you slide tiles around to attack enemies, collect gold, unlock chests and do other things. It's way too hard and it's barely a puzzle. The core mechanic is that tiles appear and you slide the whole board - a bit like Threes - but with the tiles being pseudo-random and there being about six type of tiles, sometimes you just can't do anything. The game is also plagued with a bunch of progression-related issues and a few weird technical glitches here and there. But hey, at least there are no microtransactions. This game is frustrating, there's no way around it. If you need to match 9 keys in 5 moves and you only get to match 8, you lose all of them, and if a chest appears as the next obstacle that you have to overcome, all your keys probably went into that earlier 8, so you can't do anything. Why not keep your tiles if they're not going to be high enough to win the current challenge? The various challenges have their own rewards, you'll get strength boosts for matching shields against goats, gold from defeating enemies, health from the camps and items from chests. You have a few actions to get enough matching tiles and then you either win or lose (or attack your enemy if you're in a fight). It's annoying how the game accepts 'useless' moves, like a slide that would move no tiles at all. If the board gets full, you lose a ton of hp, that should be removed, the game is too punishing. It's too punishing because tiles are almost all used for only one thing. Your shields and meat wont be of any use during the fights while they could protect and heal you, nothing except keys can be used during chest encounters, etc. The items you get from chests can really help, like swords to add damage or healing potions, but again, they way to open them is unreliable at best. When you fight goats and lose, they turn some tiles into rocks that you can't move nor use for anything and this really works toward limiting your options - again, with the large pool of tiles. 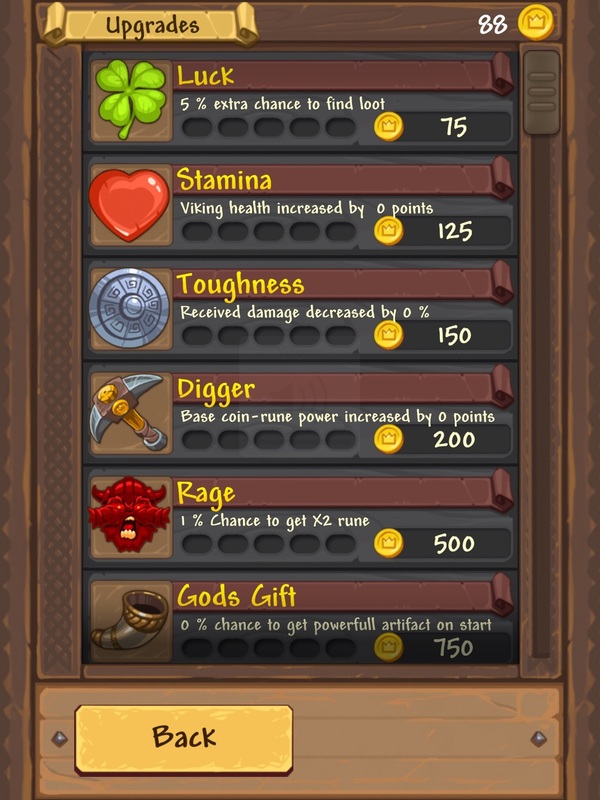 There is an upgrade system that takes way too much gold to get you anywhere decent and you accumulate it so slowly to upgrade some of your stats like health, damage taken, movement speed, number of action points and inventory space - although these last three cost a ton - and while you can upgrade the base value of gold tiles, you can't do the same for other types of tiles. Also, the prices of everything should be taken way down. 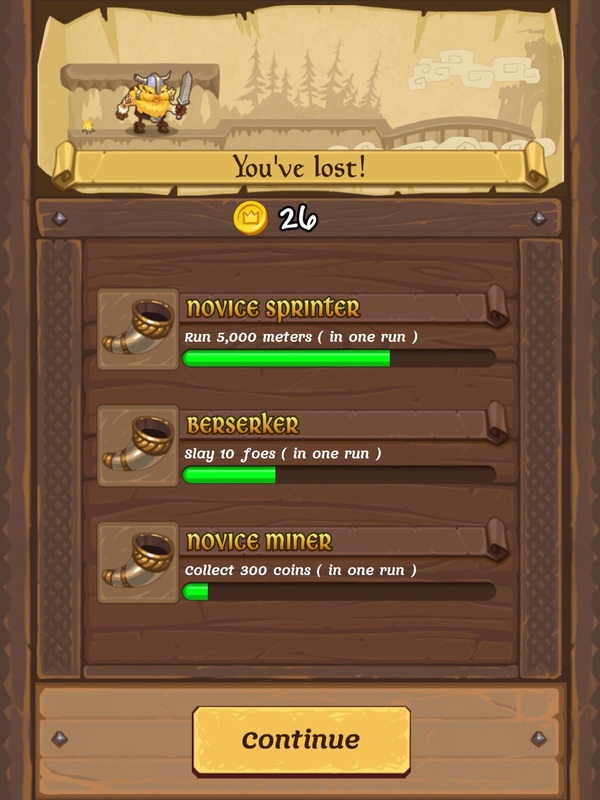 You have 'quests' to get gold, but there is no way too see them outside of the end-result screen after a run and the quests you start with are too difficult, like getting 300 gold in a single run. To make matters worse, the game asks you to 'share' your run to get 150 coins. I suppose this would have been shared on twitter or facebook, I've hit that button and nothing happened. Too difficult, frustrating and left with a few bugs, I wouldn't really recommend Lost Viking to anyone.